The weather in December seemed to be an endless run of overcast days and rain and in the run up to the 29th December 2015, I was checking the weather forecast on a daily basis and much to my surprise the forecast looked to be gradually improving with finally a sunny day forecast along with this December’s unusually very mild temperatures. 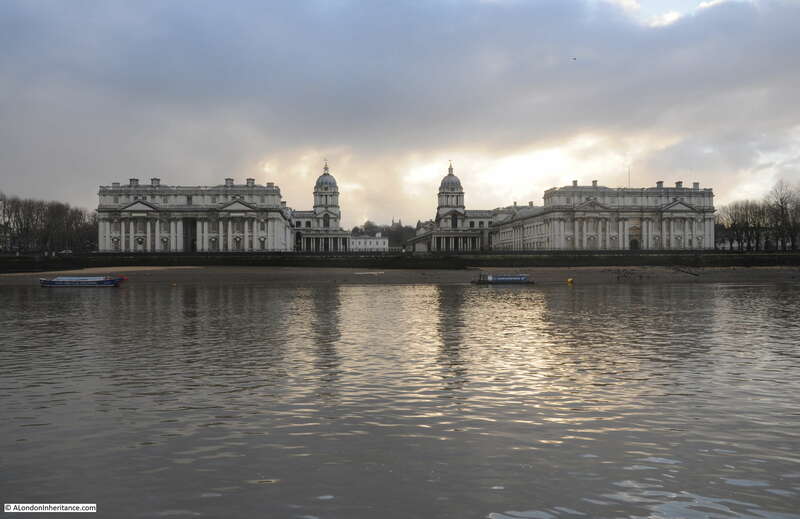 When the day arrived, and as the last of the overnight rain cleared, I made my way to the Isle of Dogs on a very quiet Underground and Docklands Light Railway, reaching South Quay just as the first hint of the dawn sun broke the dark of night. 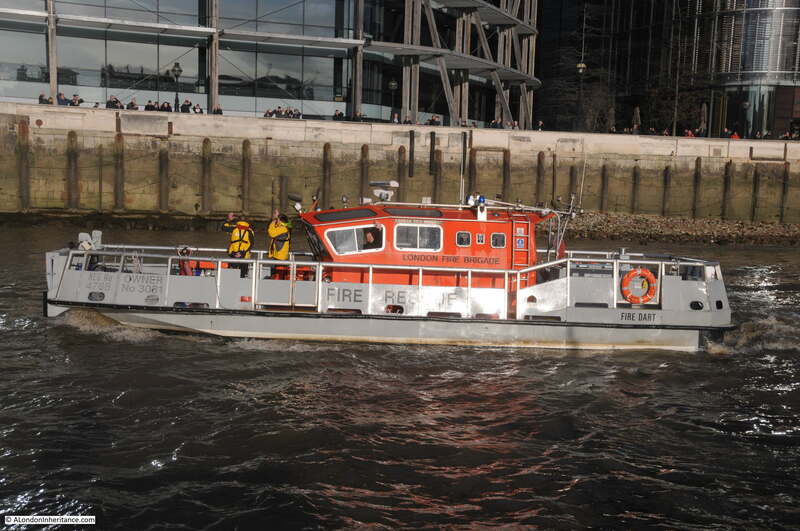 The Massey Shaw fireboat is moored in the South Dock on the edge of the main Canary Wharf office complex. 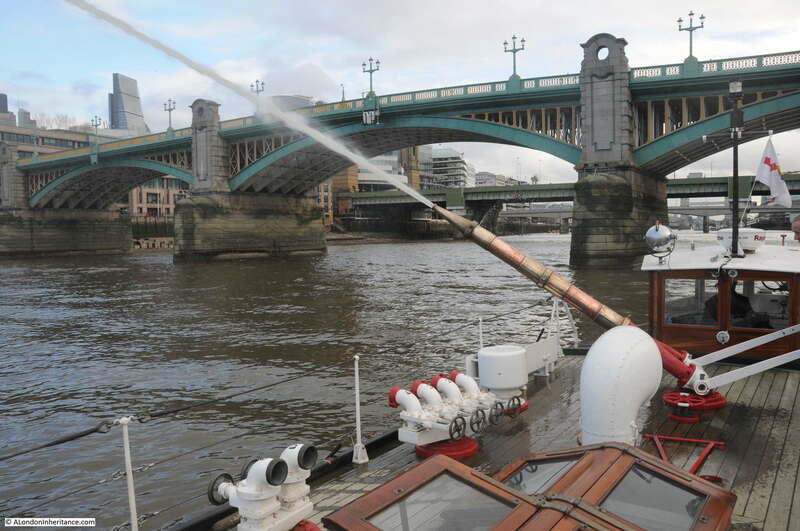 The plan for the day was to leave South Dock after nine and then travel up to central London to carry out some demonstrations of the Massey Shaw’s fire fighting capabilities during the early afternoon as part of the commemorations for the 75th anniversary of the 29th December 1940. 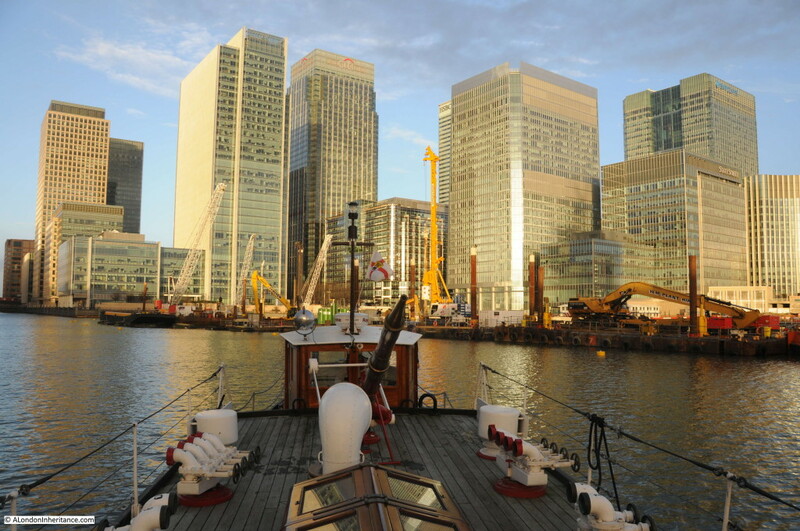 With the original 1935 engines running, and the expert volunteer crew having run through the process of preparing the boat for the day, pulling up the anodes, lifting the fenders and casting off the ropes, the Massey Shaw edged out into the South Dock as the December sun lit up the buildings of Canary Wharf. 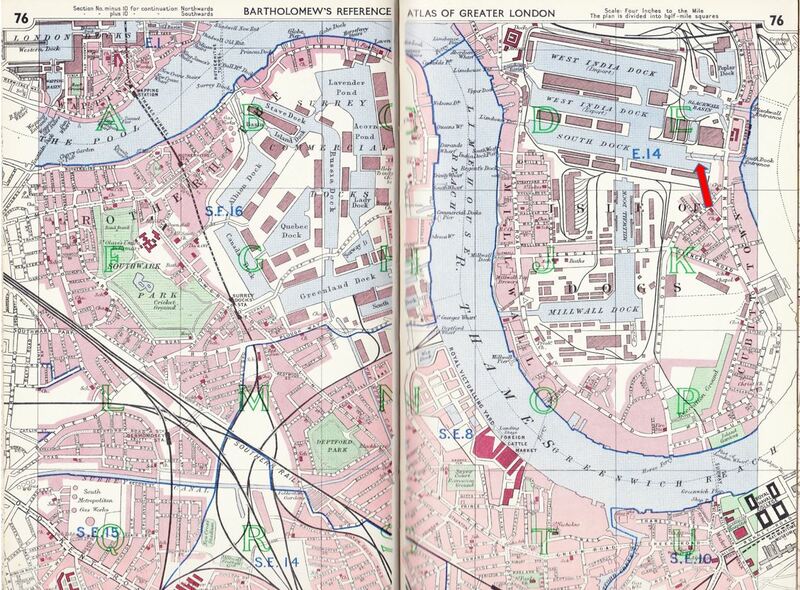 The following extract from the 1940 Bartholomew’s Atlas of Greater London has the mooring position of the Massey Shaw highlighted with an arrow and shows the entrance to the Thames through the locks at the South Dock entrance which is still the route through to the river. 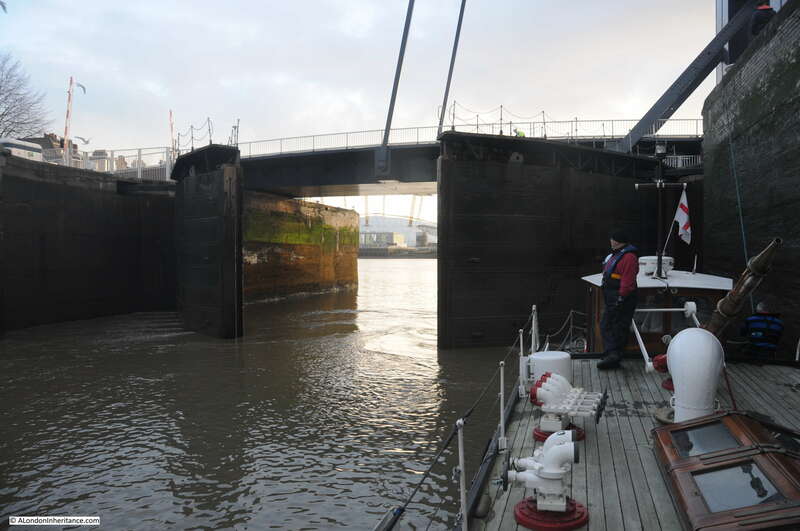 The locks are essential to maintain the water level in the docks whilst the height of the river fluctuates with the tides. 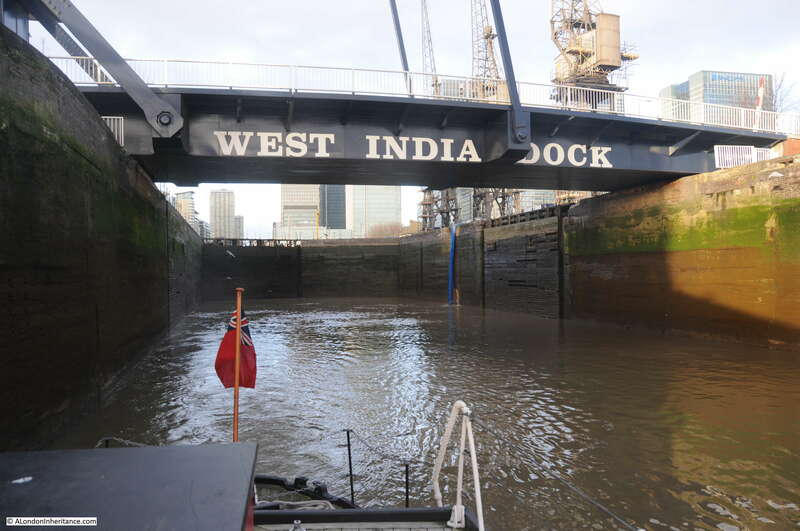 At the time we left it was low tide so whilst the Massey Shaw waited in the lock, the water level dropped as water drained out into the river. 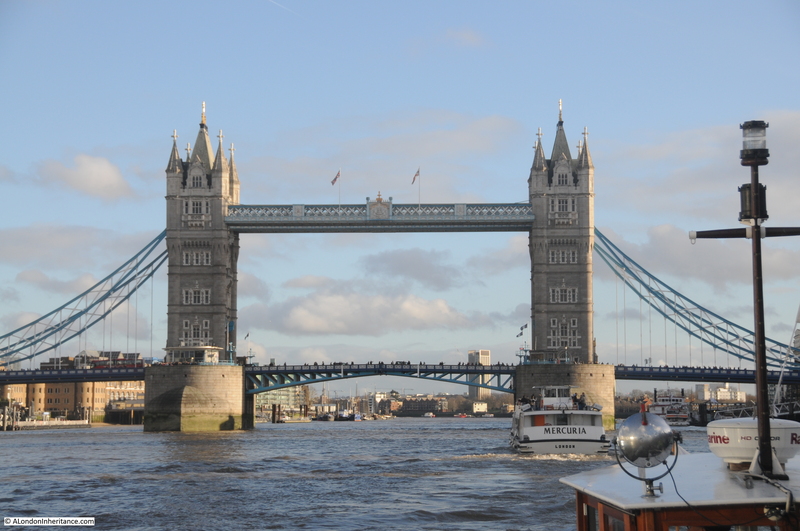 With the level of the water within the lock having dropped to that of the river, the lock gates start to open and the River Thames opens up. Leaving the lock. 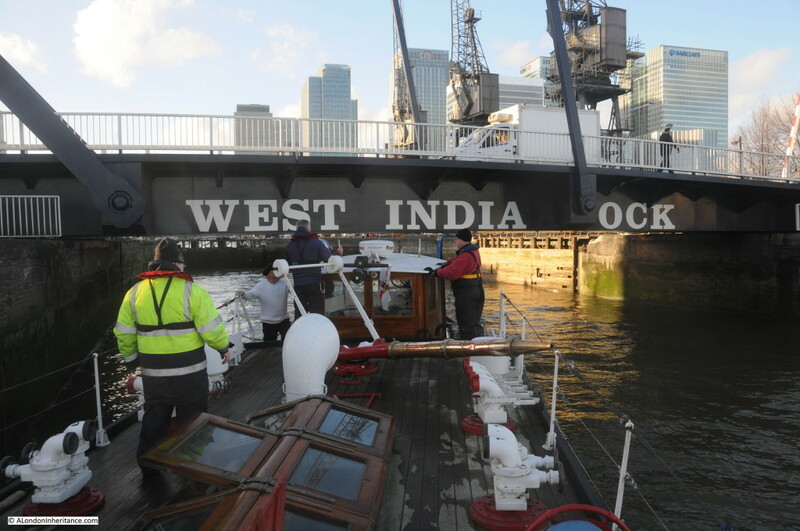 It was fascinating to think of all the ships that have passed through this entrance coming from, and departing to, the rest of the world when these docks were in use. Moving out into the river. The weak December sunshine was a very welcome sight. 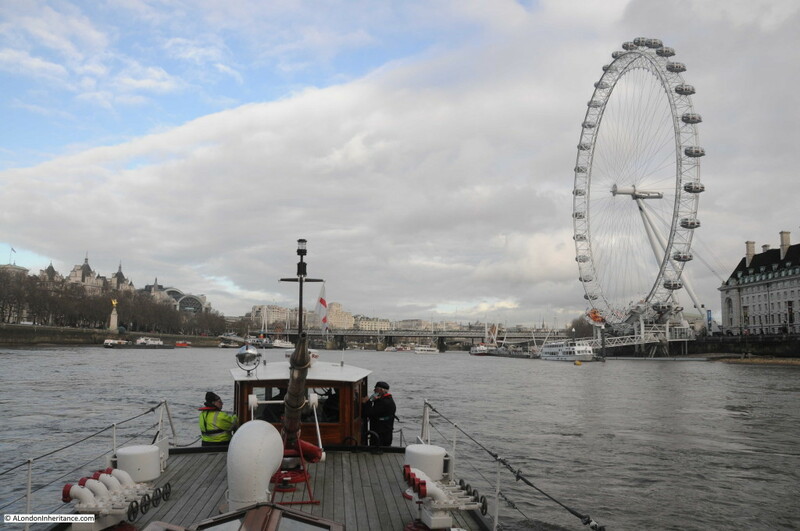 The route into London gave me an opportunity to learn more about the history of the Massey Shaw and how the boat steers and handles on the river and we had soon passed through central London, and reached Lambeth, opposite the old headquarters of the London Fire Service. Turning round, it was now the run back to the City and demonstration of Massey Shaw’s fire fighting capability. Approaching Hungerford Bridge, it was time to test the Monitor. The Monitor is the steerable, high pressure jet which is a permanent fixture on deck. 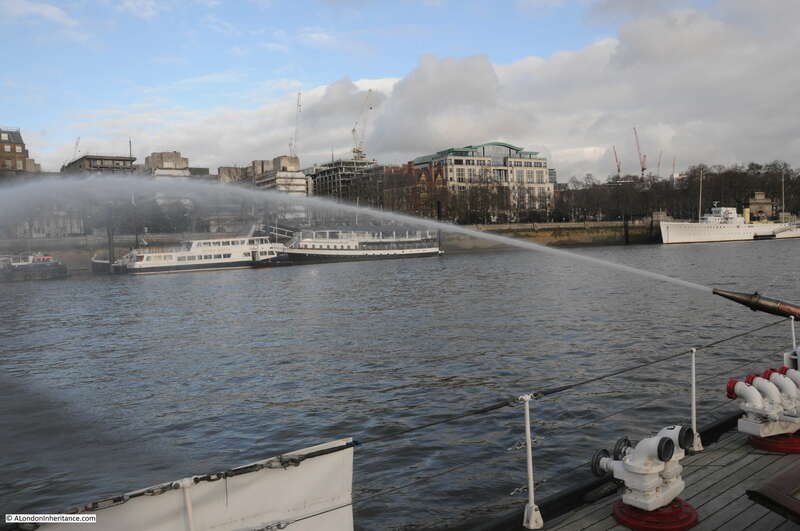 Additional water jets and hoses can be connected to the outlets running along the edge of deck, dependent on the type of fire. Switching one of the engines to power one of the water pumps results in a high pressure jet which can easily be directed towards a fire. The pressure of the jet is such that it was used not only to pour water onto a fire, but also to knock down walls where these had been left in a dangerous condition, or to provide a firebreak between buildings to prevent a fire spreading. 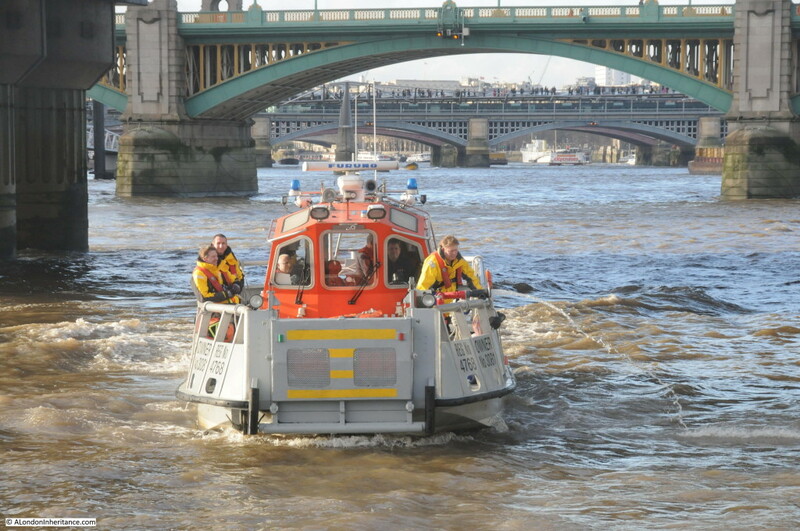 Coming up to Southwark Bridge. The monitor can be positioned at a high angle with the jet then able to reach the upper floors of the warehouses bordering the Thames, or onto ships. The Massey Shaw then carried out the first demonstration in front of the location of Dowgate Fire Station, however the light was much better for the second demonstration so I will cover later in the post. 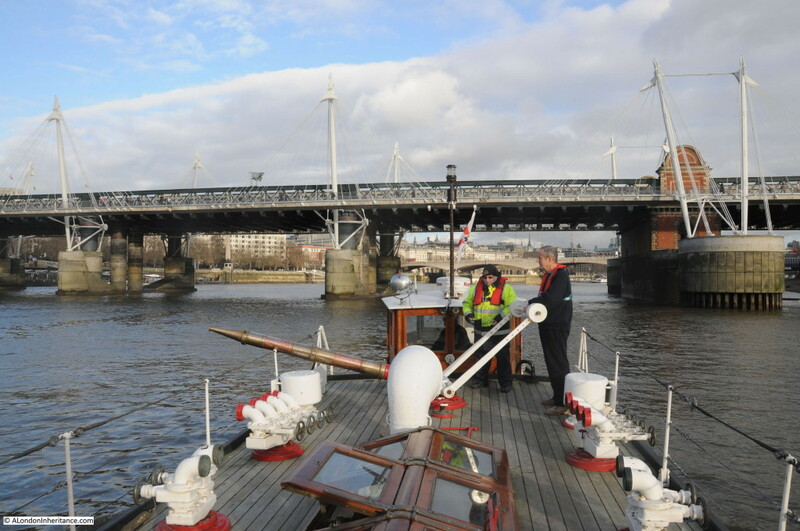 After the first demonstration it was back to moor on a swinging mooring at Bankside with the weather continuing to improve. 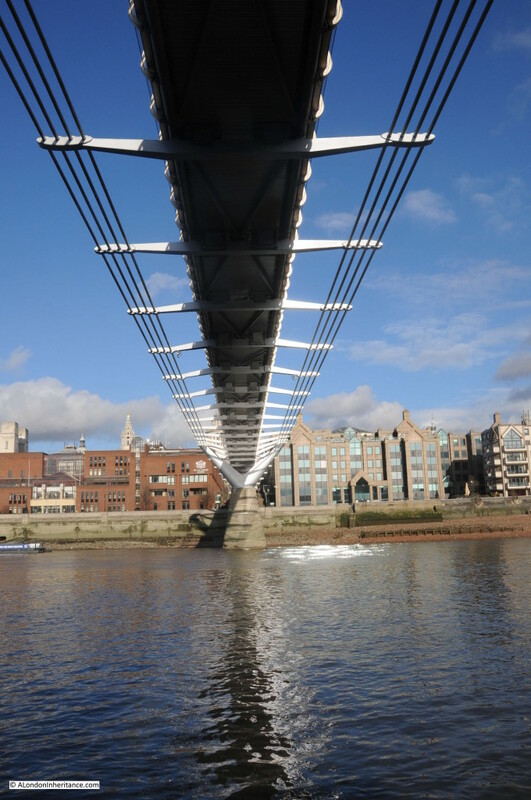 Passing under the Millennium Bridge provided a unique view of this foot bridge. 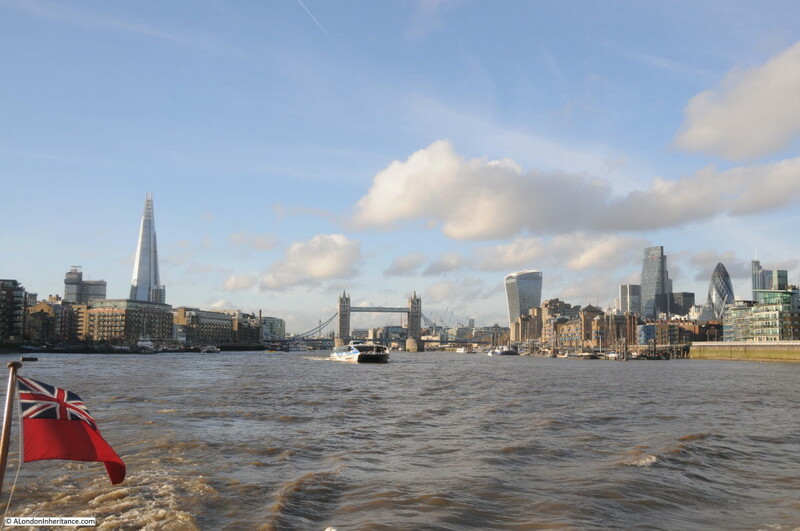 A good opportunity to enjoy the river and city in late December sunshine. A visit by the RNLI Tower lifeboat. 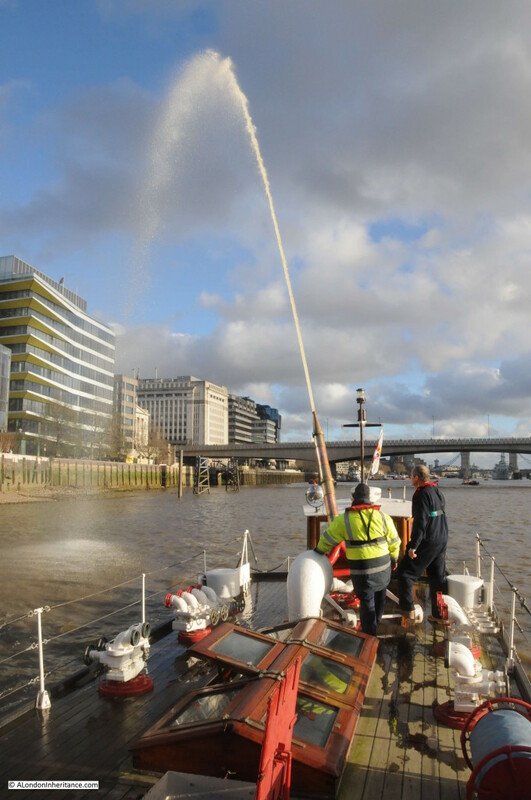 Now heading back to the second demonstration, powering up and testing the water jet whilst passing Queenhithe. 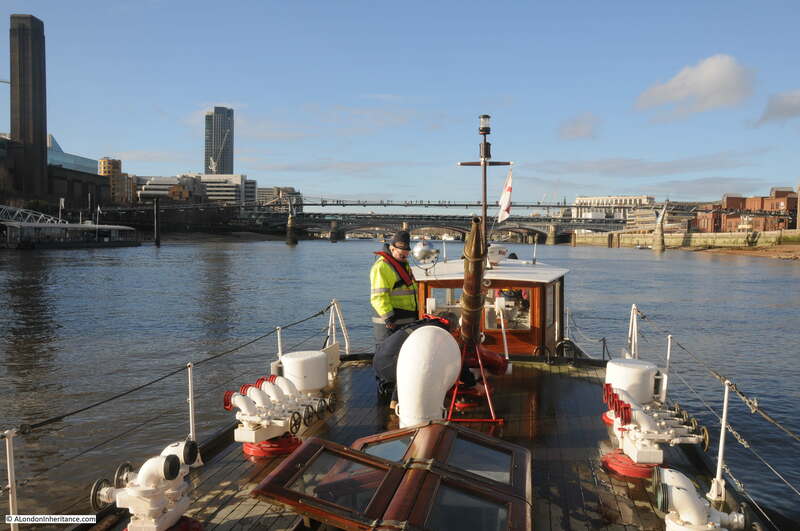 The attention to detail during the restoration was such that although a post war wheelhouse has been added, the lifebuoy is in the same position as when the Massey Shaw was operational – see the photos from the 2nd World War in yesterday’s post. 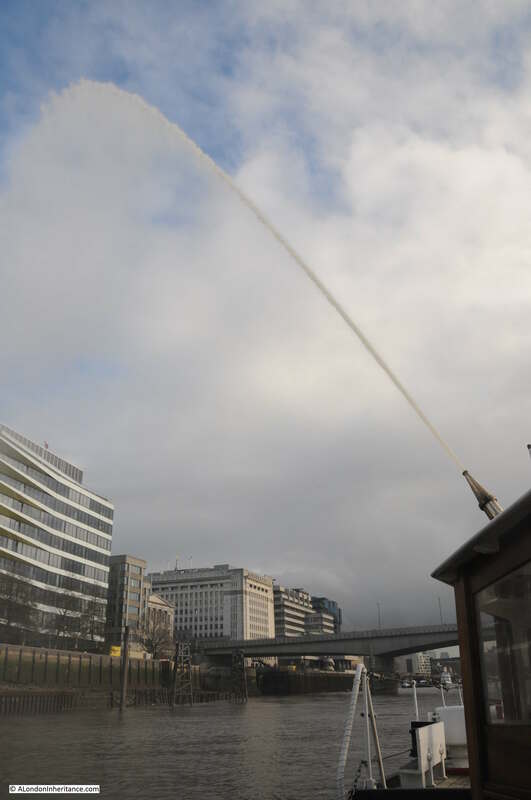 Standing off the location of Dowgate Fire Station, and adjacent to the railway bridge into Cannon Street station, the Massey Shaw gave the main display using her on deck Monitor. 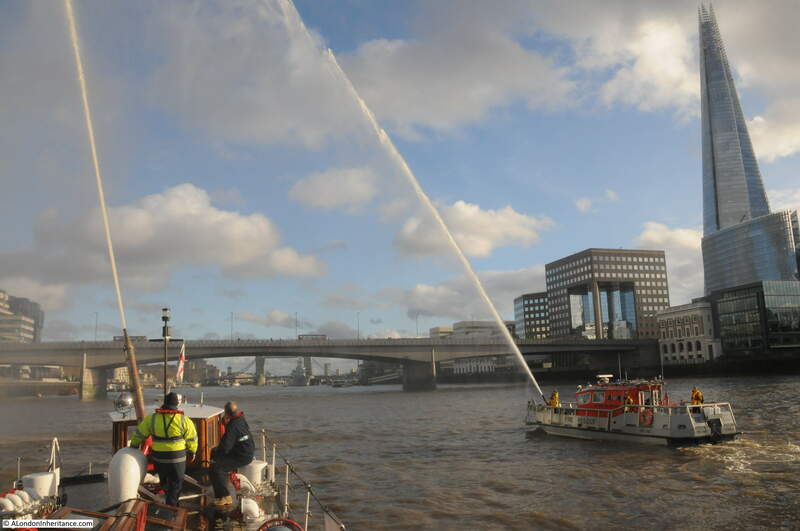 The Merryweather pumps on the Massey Shaw are each capable of pumping 1,500 gallons of water per minute through the main Monitor and the other deck outlets. This equates to an incredible 11 tons of water an hour. The following video shows the Massey Shaw in action. Although the many warehouses that ran along the Thames have long since disappeared, the river edge continues to be populated with buildings that edge directly onto the river. 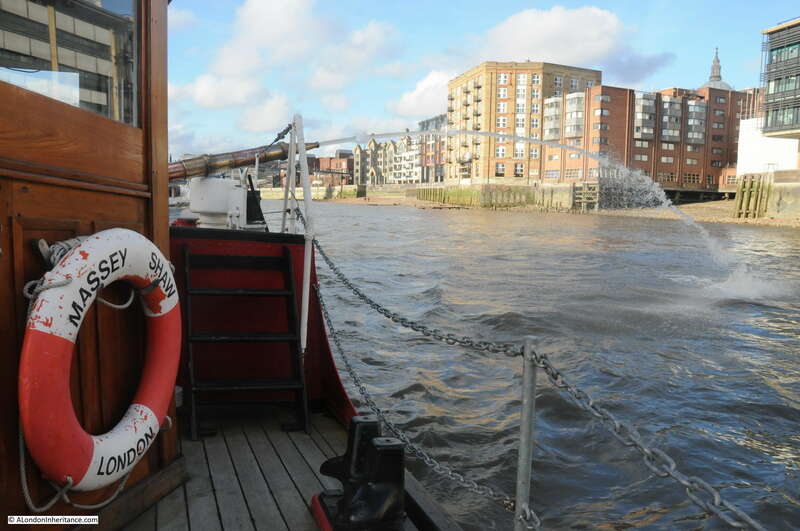 These buildings, along with the many different types of craft that continue to travel along the river require the ongoing support of a Fire Service that can approach a fire from the river and support their land based colleagues, as well as providing rescue services on the river. 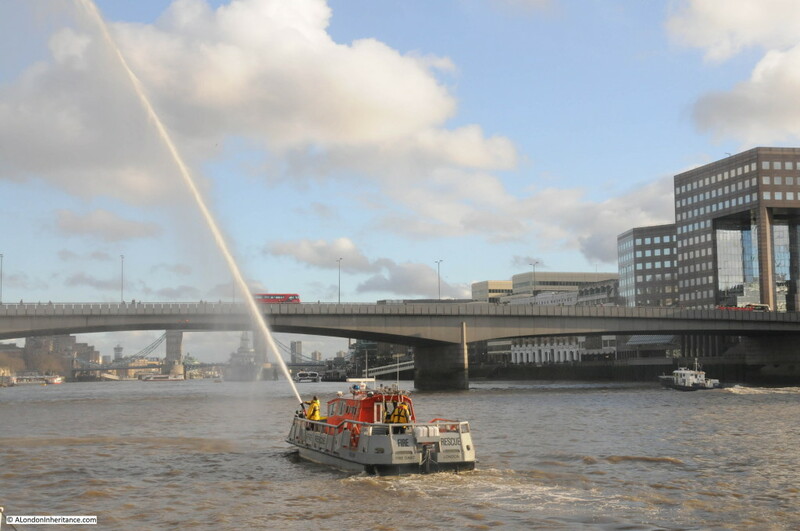 As part of the commemorations on the 29th December 2015, the Fire Dart, one of the fire boats currently in service with the London Fire Brigade arrived to demonstrate current fire fighting capabilities. Although of a very different design and using completely different construction materials, the function is basically the same – pump large volumes of water from the river at high pressure onto a fire. 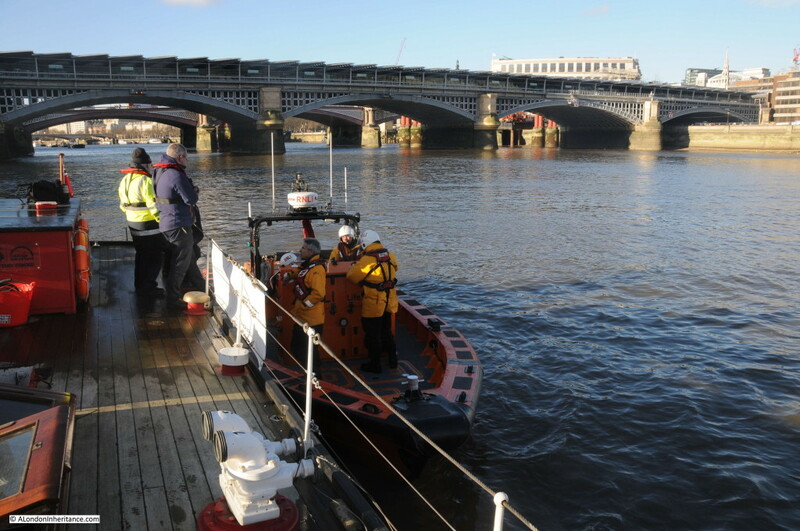 Note also the very different uniforms of the crew compared to the wartime Massey Shaw (see yesterday’s post) where today life saving and protection from water and the elements are essential functions of the clothing worn by the crew. Comparing the uniforms of today with that of the men who fought fires during the war or sailed to Dunkirk in what appears to be have been little more than a thick jacket and trousers and a flat hat only adds to my admiration of these early fire fighters. 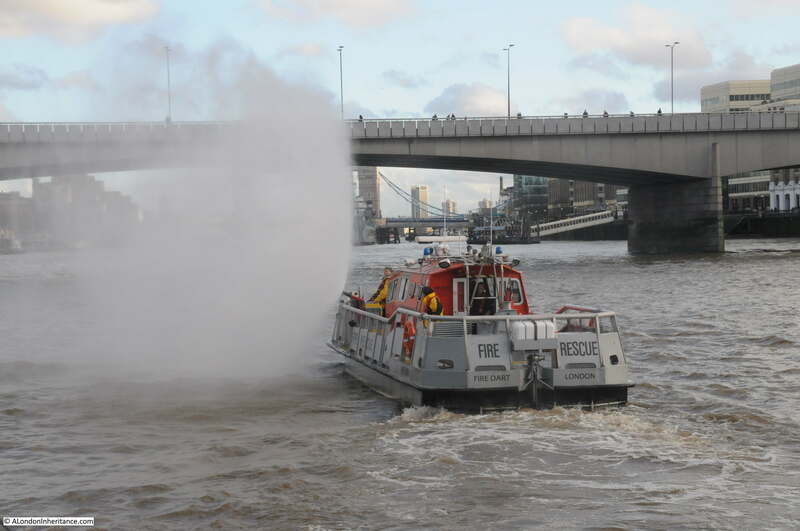 The Fire Dart, one of two current London Fire Brigade fire boats based at Lambeth at the river fire station demonstrating the use of their water jet. The main monitor on the Fire Dart is more flexible than that on the Massey Shaw in terms of the type of water jet that can be swiftly delivered. The jet can be quickly changed from delivering a single high pressure jet for force and distance, through to a cloud of water spray. 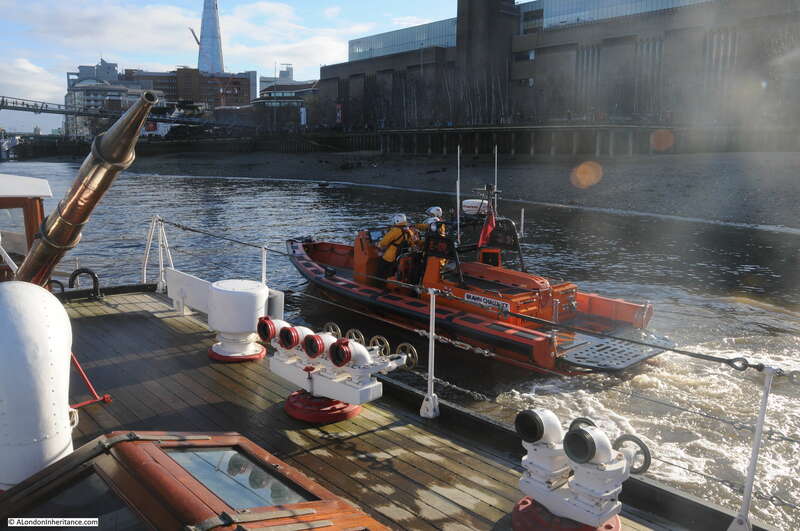 The Fire Dart in front of London Bridge. Watching the Fire Dart run through its demonstration. 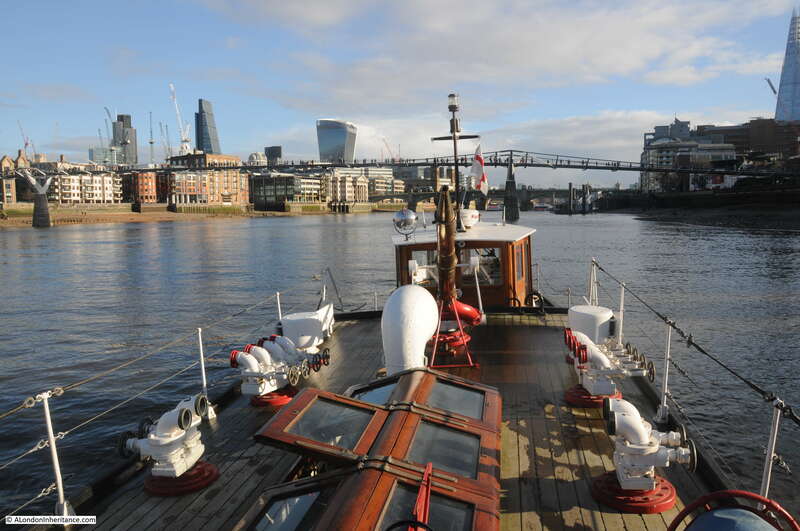 Now both the Massey Shaw and the Fire Dart run up their main deck Monitors. The two jets at full pressure. Although the Fire Dart has more flexibility in how the water jet can be configured, the Massey Shaw jet appeared to be capable of slightly higher pressure, reaching higher than the Fire Dart. 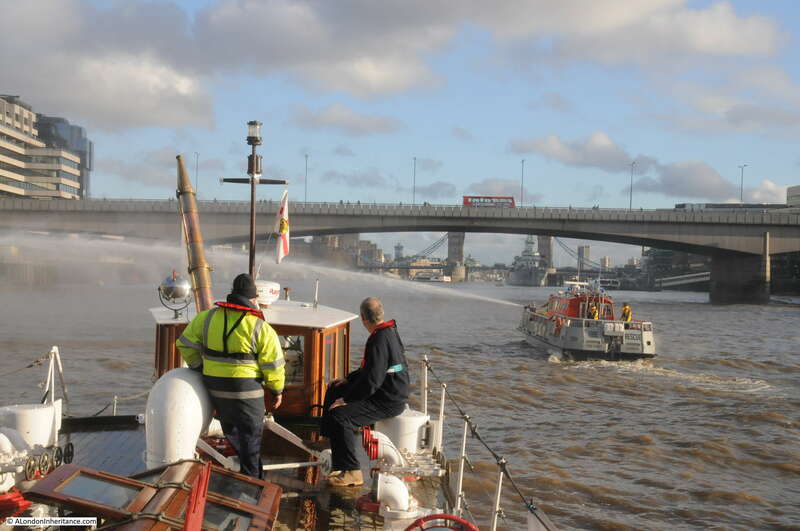 Amazing to see two fire boats in actions, although 80 years separate their design, construction and materials, they are still performing the same basic function. The Fire Dart having finished demonstrating 2015 fire fighting capabilities, now heading back to Lambeth. It was then time to head back to the Isle of Dogs and enjoy the river and views of London on a very mild December afternoon. Passing HMS Belfast on the river in a relatively low craft gives an appreciation of the size of the Belfast not always appreciated from the shore. 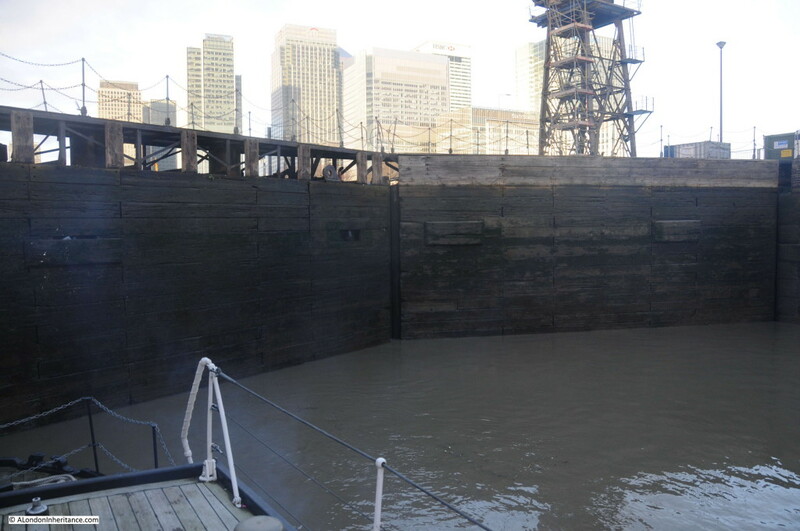 It also gives an indication of what it must have been like to approach a large cargo ship in difficulties or on fire in the much smaller Massey Shaw. 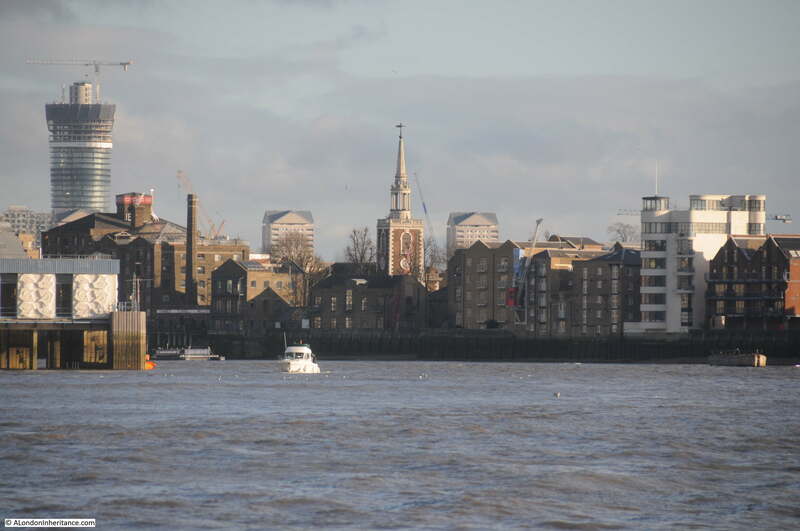 Looking down the river towards Rotherhithe. And a final view back towards the City. 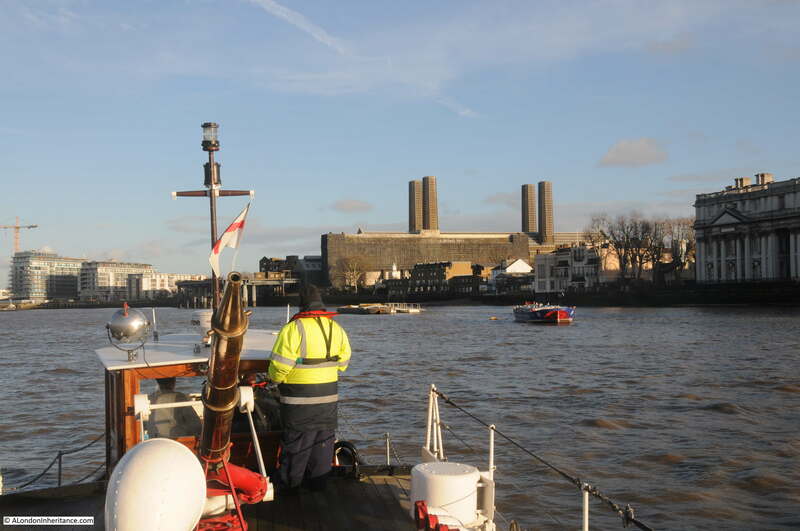 Passing Greenwich and approaching Greenwich Power Station. Running between the Isle of Dogs and the Greenwich Peninsula. I could not quite believe that this was late December. The flag of the Association of Dunkirk Little Ships. All too soon we had returned to the South Dock on the Isle of Dogs. 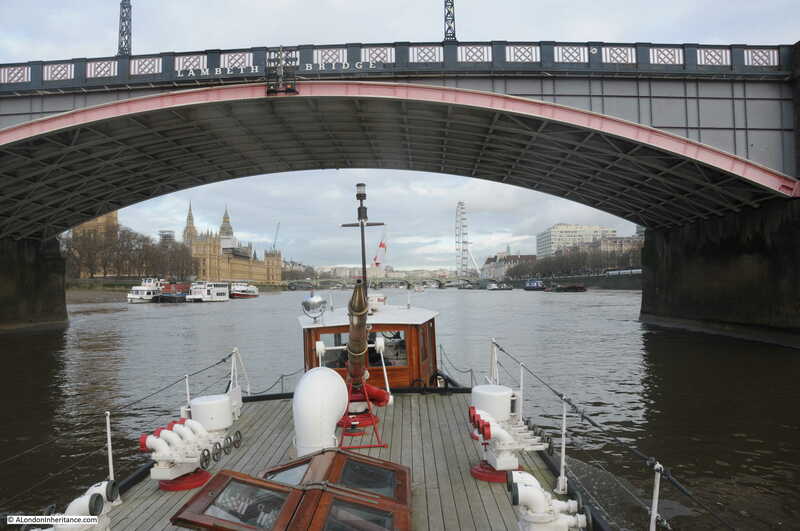 Since departing, the tide had risen and there was some discussion as to whether the Massey Shaw would fit under the bridge, even with the mast on the wheel house lowered. Although the bridge states West India Dock, as can be seen from the 1940 map shown at the start of this post, this is the entrance to the South Dock, with the West India Docks (import and export) being the two more northerly docks, although they are interconnected. Manchester Road is the road passing over this bridge. 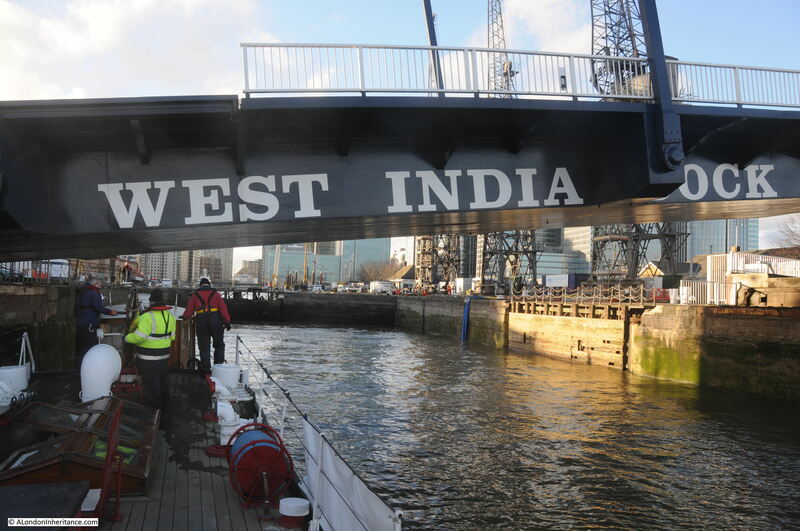 In the end, the safest decision was to raise the bridge to allow the Massey Shaw to enter the lock without any risk. 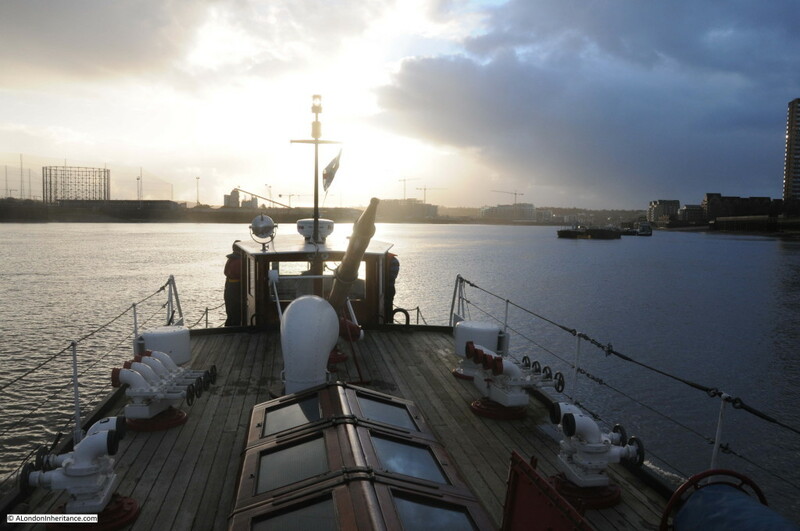 It was a remarkable day out and hopefully a fitting tribute to those who worked on the Massey Shaw on the 29th December 1940. The attention to detail during the restoration means that being on, and seeing the Massey Shaw in action is as close to experiencing the fireboat as it would have been in 1940 as it is possible to get. 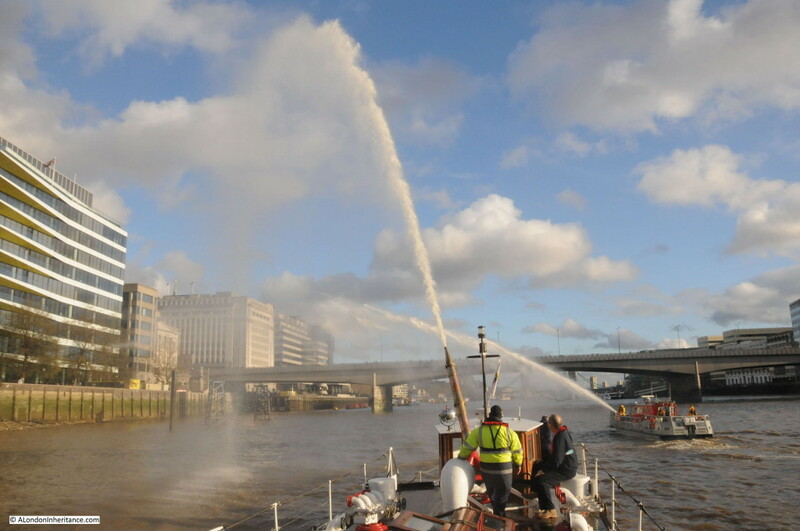 It was a fantastic experience on a mild and calm sunny day, but consider what it must have been like for fire fighters on the boat on a cold winters night, soaked by the mist from the water jets, fighting fires as the City continued to be bombed with smoke and burning embers being blown across the river. My thanks to the Massey Shaw Education Trust for the day, and to the whole volunteer crew who provided a wealth of information on the history of the Massey Shaw and the operation of the boat. I hope that yesterday and today’s posts have provided some insight into this historic craft. The web site of the Massey Shaw Education Trust can be found here for more details of events and how to support this remarkable craft. 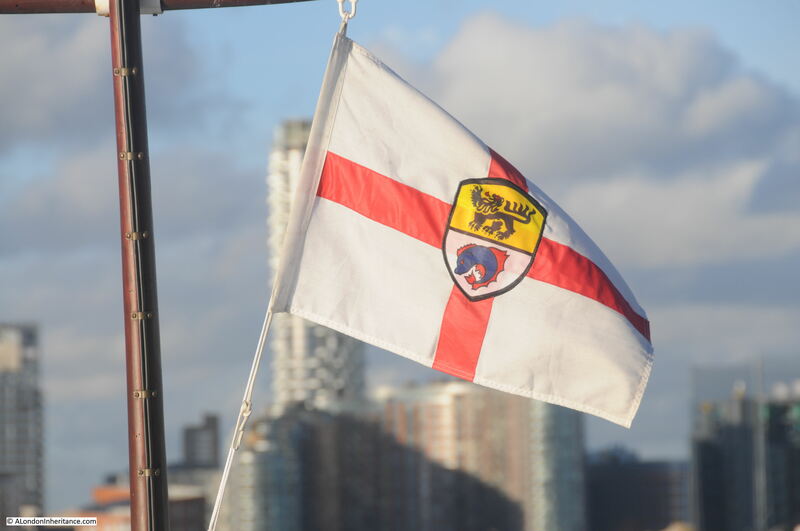 This entry was posted in Events and Ceremonies, The Thames and tagged Fire Dart, Isle of Dogs, London Fire Brigade, Massey Shaw, River Thames on January 3, 2016 by admin. Another two excellent articles,Admin! 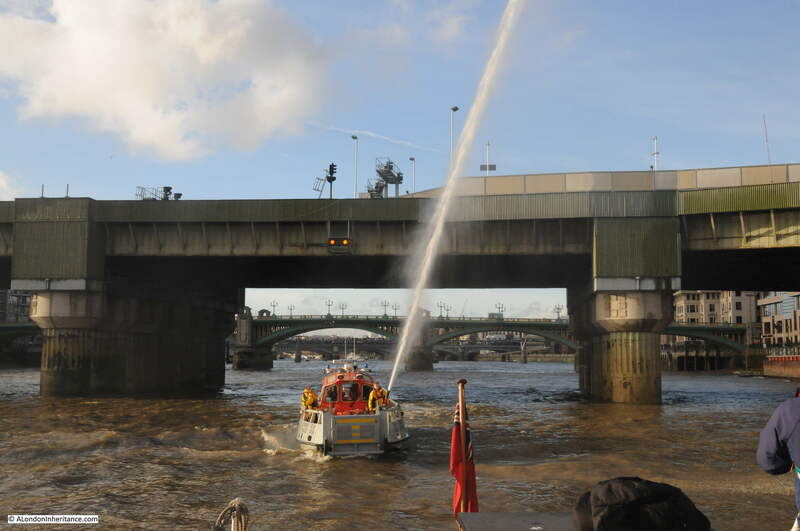 Very informative about the hard work put in by those firefighters,both on the Thames and at Dunkirk. I hope you managed to spot yourself on the boat, on the local news that night? Hi Jo – yes I did see the local news, was interesting to see the boat from the shore. David. As always, a fascinating and interesting article. Thanks for the feedback Michael, really appreciated. Stumbled upon your site when searching for the De Keyser Royal Hotel, my grandmother was working there and recorded as a corridor maid in the 1911 census. A fascinating site, I’m sure my 87 year old father who was born in Chelsea will be very interested! Thank you. 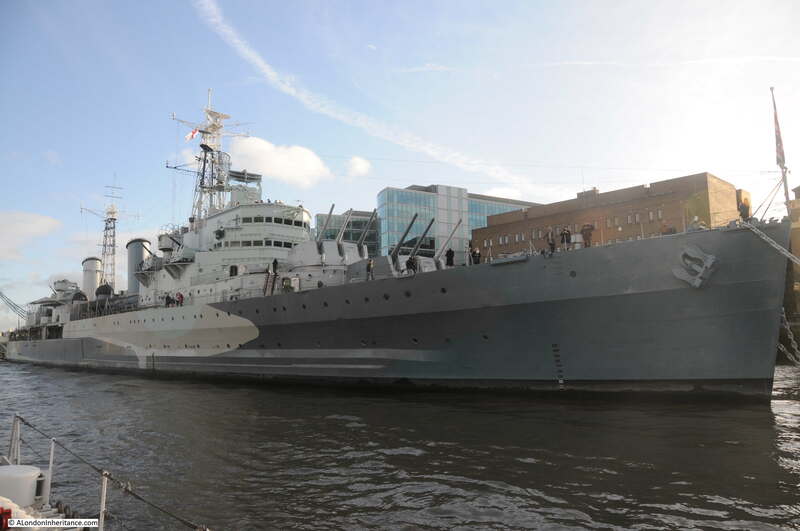 Two great articles – what a fascinating day you had and thanks for reporting the history of the remarkable vessel to your readers! Thanks Anne – yes it really was a fascinating day and the weather was good as well for a change. Gosh, how fascinating! How on earth did you get invited aboard? Thank you so much for sharing it with us. Only recently discovered your blog, which I love by the way. 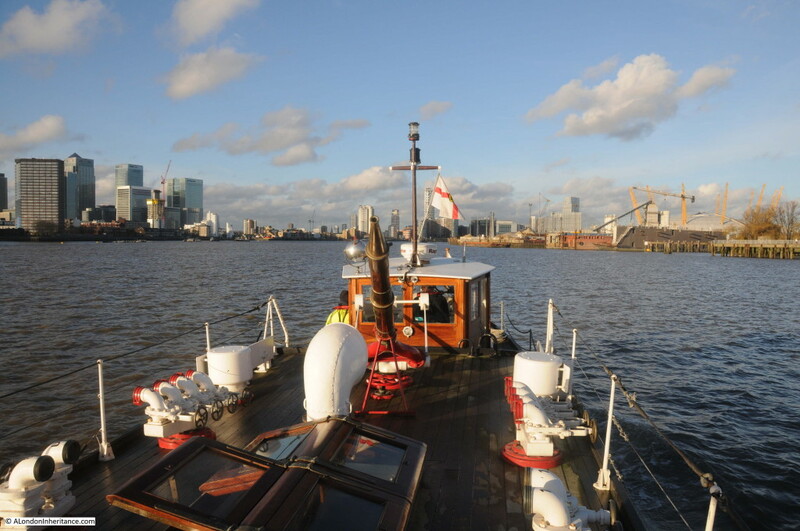 A fascinating post – I went aboard Massey Shaw years ago through a friend of my Dad’s who was in the LFB. Saw her (and you I guess) on the 29th as I was guiding a walk in the City commemorating the 75th anniversary of the raid.